I once had a client who was a competitive ballroom dancer (with his wife as a partner). He had been having a hard time learning new dance moves. Later, when he tried to reproduce the steps he’d learned, he would forget them and get frustrated. He felt his wife was growing increasingly frustrated with him, too. He had what you might call ‘performance anxiety’. Since they were competitively dancing for fun, and it was no longer fun, he came to me for help. Here are two of the beliefs he expressed to me during the early parts of the session. How do we interrupt that sequence and insert a sequence that has better results? Well, for me, the first step was to get him out of that emotional state. So, I asked him what he liked to do besides dance. He mentioned that he’d been a high-level, high school athlete (I won’t mention the sport as it might give him away — but it involved lots of coordination). He said he loved to cook. He said that when he saw someone cook something, he could reproduce that dish without even writing the steps down. You should have seen him light up talking about it. So, I dug deeper into that strategy. Why? It was a perfect fit. He saw someone go through a set of actions and he was able to reproduce those actions himself, without any need for any other instruction. That’s exactly what he needed to do when his dance instructor demonstrated a new move. He needed to use his cooking strategy for learning the dance moves. What is a strategy? 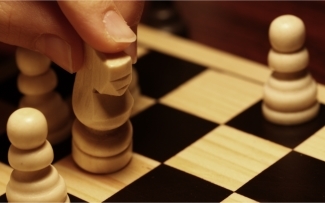 In NLP terms, a strategy is a series of thoughts, in a given context, that result in a feeling/behavior/action. If we want to change the way someone feels (or behaves), sometimes a strategy change is just the thing. Now, strategies are usually not conscious, so it’s not about giving someone advice about what to do. Sometimes what will help people the most is a new strategy or new content in an existing strategy. Or, to apply an existing strategy to a new context. A basketball player shooting a free-throw might take a deep breath, bounce the ball exactly 3 times while imagining the shot going in. They say internally, “Yes” and get a good feeling. Then they raise their arms in a precise way and shoot. Done consistently, that might be an effective strategy that helps them reach their goal. A smoker might look at the clock, notice it’s 15 past the hour and say to himself, “It’s about time I had a break.” Then, he might picture himself standing outside, having a cigarette with his buddies and feeling good. That motivates him and he gets out of his chair and goes to have a cigarette. That’s a strategy too. But if they want to stop smoking, it’s a strategy that might get in their way. It’s a pattern that’s ingrained that might run, even after they’ve consciously decided to stop. One way we can help with NLP is to install a new strategy, or modify the existing one to achieve a different outcome. It turns out that my client did very specific things when watching someone cook. As he watched, he made mental imagery of himself doing the same steps. He also imagined people enjoying the food and about all the different ways he might use what he was learning. He made lots of positive internal comments (he talked to himself, inside his head) about learning all this stuff and he had a lot of good feelings as a result of thinking those thoughts. Each of those imaginary movies and internal sounds and feelings had specific qualities that were important. I then asked him what he thought about when he was learning a new dance sequence. Guess what? It was different. When his instructor was demonstrating, he would imagine himself forgetting the dance moves and being embarrassed when he messed up in performance. Then, there was some negative self-talk about how terrible he was. If you’ll notice, his ‘success’ and ‘failure’ strategies had a similar structure. They both included imagery of results projected into the future with self-talk commentary and feelings as a result. It’s just that one strategy supposed positive outcomes and the other, caused performance anxiety. Now, a lot of people had already told him to ‘think positively’. But most folks aren’t well trained in how to think positively. So what happens is they try to force positive thoughts while at the same time, running their negative imagery and self-talk. If you’ve ever tried to do positive affirmations when you don’t really feel it, you know what I mean. You might look in the mirror with a big smile on your face and say, “Every day, in every way, I’m getting better and better.” All the while, your mind is making imagery of how your boss yelled at you last week, and that’s not better. Your internal dialog channel is commenting about how you’re getting older and your body is running down, and that’s not better. In the meantime, you’ve got a big, fat, lying smile on your face. In the words of a buddy of mine, “What is the universe going to pay attention to; what you really feel, or the affirmation you’re paying lip service to?” Or, in my way of thinking, when you’re not 100% congruent, you will probably get mixed results. What’s The Solution To This Performance Anxiety? We changed the internal dialog, too — we made it more like his internal dialog about cooking. I had positive anchors ready to attach to this new way of thinking. We rehearsed (future paced) a bunch and then sealed the deal with hypnosis. In trance, I told him to dance like he cooked. We also worked on getting his experiences as a high school athlete fresh in his mind and worked to resolve the belief systems about being coordinated and remembering steps easily. That’s a pretty comprehensive approach to helping him with his performance anxiety. He wrote me a nice letter, telling me how well he was doing. Try that with a script.